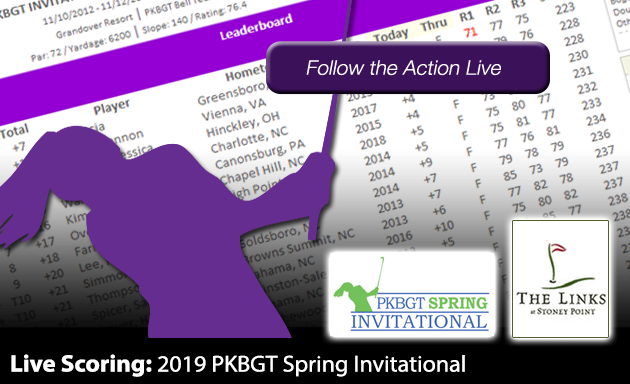 On Saturday, March 16, the Peggy Kirk Bell Girls’ Golf Tour completed the first round of the 2019 PKBGT Spring Invitational at The Links at Stoney Point in Greenwood, SC. The changing of seasons from winter to spring instills a sense of hope. Budding nature, birds chirping and golf balls flying through the air, traveling slightly farther with each passing day. Sunglasses, sandals and sunny beaches remain off in the distance, but warming temperatures tease the impending summer fun peeking over the horizon. 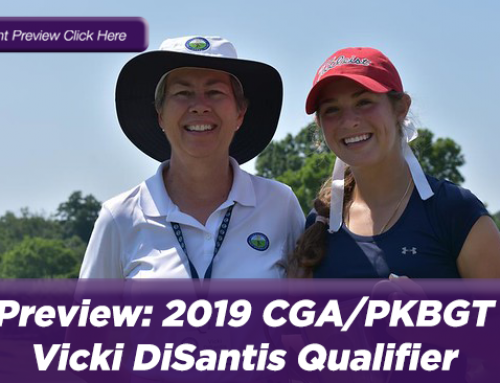 In Greenwood, South Carolina, 42 of the PKBGT’s top talent gathered at the home course of the Lander University Women’s Golf team to ring in the new season. A shallow layer of clouds covered the morning sky while players hoisted golf bags and pull carts from the trunk of their vehicles. Despite a celebration of the changeover into toastier temperatures, players weren’t quite ready to ditch the winter gear. A chill in the air accompanied by a steady breeze bit through thin layers of clothing. The sun came out in small doses and with it spurts of that cozy spring comfort. On the course, it was a tight race on the first day of competition. Each player looking to set themselves up to make a run at the title come Sunday. Across the three divisions, the greatest margin of separation between leader and field was two strokes. We take a look across the board, and reflect division-by-division on the first round of play! 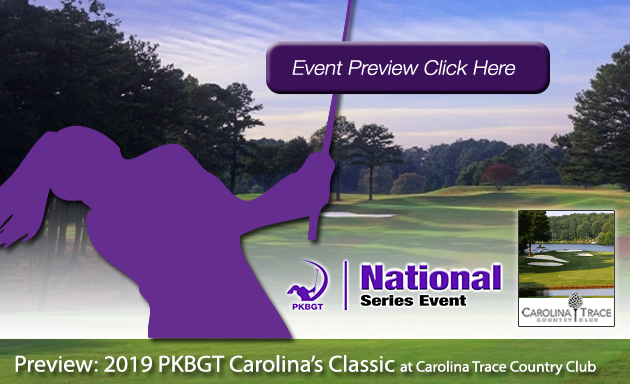 Leading the 21 player Bell National field following the first round of play is Mary Kathryn Talledo (Spartanburg, SC 2021). Talledo, often referred to as “MK Swag”, finished the round with a final score of 74 (+2). 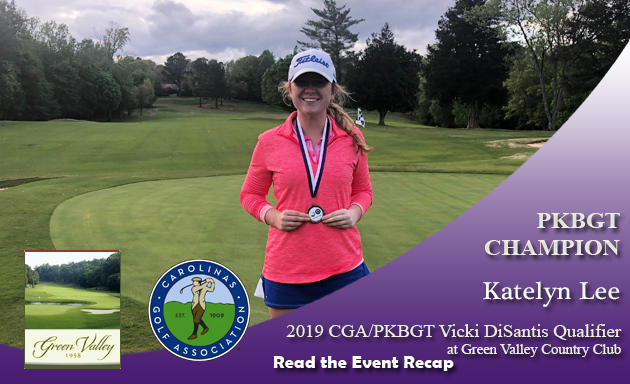 Her front was up-and-down, peaking with a birdie on the sixth hole followed by three straight bogeys. 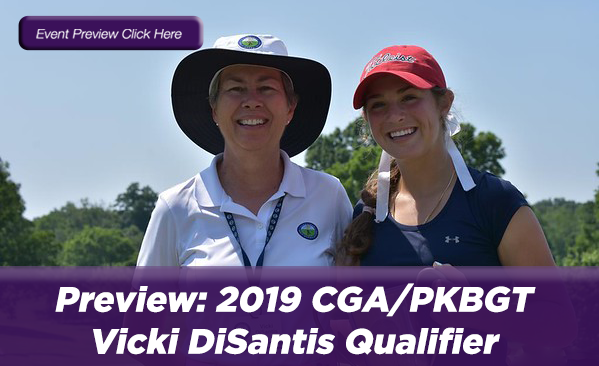 She found her stride toward the end of her round, with two birdies on the last four holes to put her in sole possession of the lead. 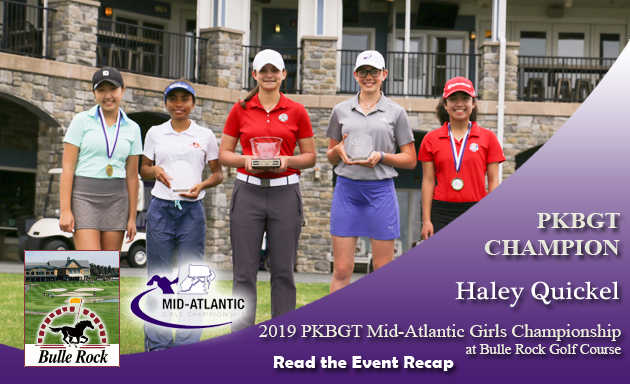 Trailing by one stroke in a two-way tie for second place is Muskan Uppal (Cornelius, NC 2019) and Chloe Holder (Williamston, SC 2021) shooting 75 (+3) on the day. 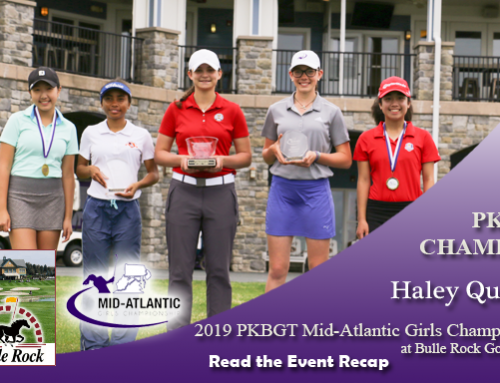 Uppal jumped to an early lead with two birdies on the front nine but a double-bogey on the difficult 17th green pushed her out of the lead and into second place. Holder played consistently all day. A double bogey set her back on Hole 11 but a birdie on the 14th brought her back to within a stroke of the leader. Karlee Vardas (Lexington, SC 2021) sits alone in fourth place following a first-round score of 77 (+5). 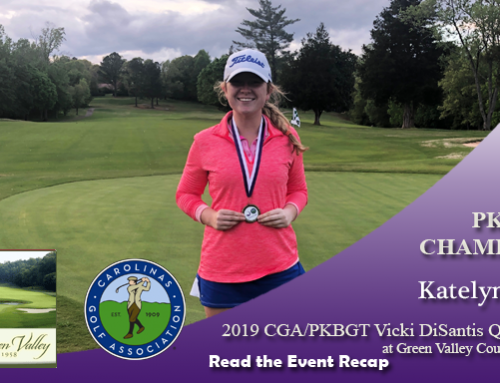 Vardas’ round was filled with momentum shifts as she finished with two birdies to combat a handful of bogeys. Despite the inconsistent opening round, Vardas is just three strokes off the leader entering the final round. There’s a party in fifth place following the first round of play as no one was willing to step down. 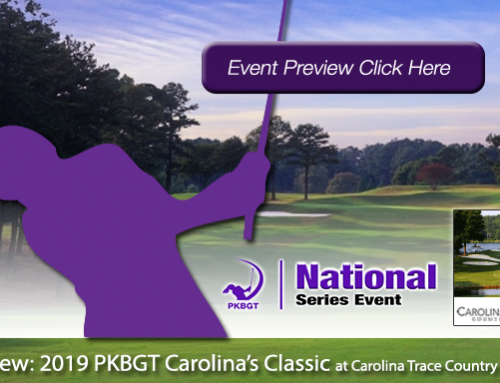 Kennedy McGaha (Honea Path, SC 2021), Sarah Boteler (Greenville, SC 2021), Paris Fieldings (Suffolk, VA 2023) and Madeline Ananthasane (Auburn, GA 2020) all sit in a tie for the fifth spot on the leaderboard after rounds of 78 (+6). In similar fashion to fifth place on the Bell leaderboard, several players refused to give away first place status following the first round. Madison Lynn Dixon (Inman, SC 2022), Autumn Carey (Manning, SC 2023) and Abby Franks (Roebuck, SC 2023) sit in a three-way tie for first place following the first round. Franks made two birdies on the day while Carey and Lynn Dixon each mad one, on the way to scores of 78 (+6) to set the pace. Macy Pate (Boone, NC 2024) sits just one stroke behind the leaders after a first-round score of 79 (+7). Pate played a strong front nine but dipped on the back, struggling to close out her round. Still very much in contention of the championship, Pate looks for a strong performance in the second round to hop atop the leaderboard. 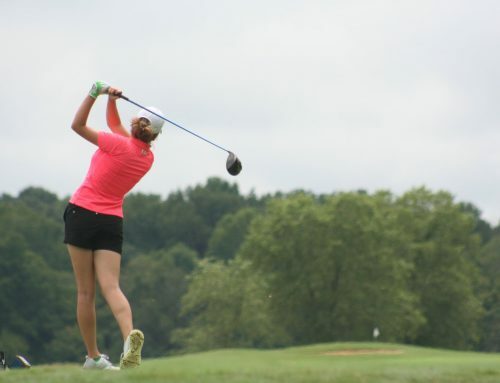 Rounding out the 11 player Prep Preview leaderboard is Emma Landis (Virginia Beach, VA 2020) with a first-round score of 81 (+9). Only two strokes behind the trio of leaders, Landis is one solid round away from moving up for a strong finish. Not only is Ellen Yu (High Point, NC 2026) the youngest player in the tournament field, she is also the leader after the first round of play in the 8 player Futures National division. Yu’s first-round score of 81 (+9) came with a strong finish after a rocky start with a string of bogeys on her front nine. Despite the hiccups, Yu remained calm, taking back her round and the top spot on the leaderboard. Two-strokes behind Yu, shooting a first-round 83 (+11) is Madison Messimer (Myrtle Beach, SC 2025). Another young player in the field, Messimer ran with a birdie on the second hole to set the pace of her round. Finishing the back nine with three pars on the last four holes left Messimer in place to strike in the final round. In third place after a first-round score of 87 (+15) is Abigail Cheney (Guyton, GA 2021). Rounding out the Top 5 is Bethany Welch (Matthews, NC 2023) and Sophia Laliberte (Denver, NC 2021). Welch is in fourth place after a first-round score of 89 (+17) and Laliberte is in fifth place after shooting a 91 (+19). With tomorrow’s final round brings an opportunity to solidify a win for those atop the leaderboard. Resilience is the name of the game for those trailing the leaders and a bounce-back round could catapult anyone into the Top 5. Play is set to begin at 10 a.m. with the Bell National field taking the tee first. The inaugural Spring Invitational remains up for grabs and a winner will be determined Sunday afternoon. We wish all of our competitors the best of luck in the final round of play!